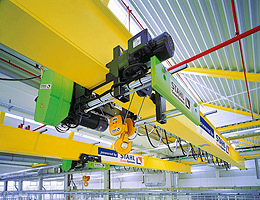 STAHL CraneSystems’ wire rope hoists cover the S.W.L. range from 500 kg to 125,000 kg. They are based on a technically mature modular system that guarantees cost-effective production at the highest level of quality. What’s special about this: we can combine the individual components at will so that each of our wire rope hoists is ideally designed for your requirements. Regardless of whether it’s a standard or an individually customised product. The attractive design of STAHL CraneSystems’ wire rope hoists masks a compact, sturdy construction which is extremely low-maintenance. Their reliability, power and long service life are above average. The particularly smooth, precise starting and braking characteristics are common to all.